I am blown away at the number of medical commercials on TV these days (in the US). They’re a huge portion of the evening broadcast. You can’t watch network television without being warned of ED. Did you know that advertising pharmaceuticals directly to consumers is the most common way people receive health communications? It’s true. No one is suggesting the viewers get off their asses to exercise. There’s no money in advertising the health benefits of zucchini — unless you’re the Food Network! No one wants to hear the bad news of health issues. Instead, we’re fed commercials of attractive actors frolicking in a meadow. The visual message is Happiness, even as the voice-over suggests the medicine might cause exactly what it’s trying to prevent. Everyone is interested in a sunnier life. When you’re shopping, how closely do you monitor the price tags? We tend to think we’re very price-conscious. We do pay attention to price, it’s true, but there are many more factors at work. Price is often one of the least important concerns when we find the right item. For example, we can get generic shoes at many stores. Do you buy the cheapest shoes you can? Or do you look for something that expresses a bit about your personality? If not shoes, maybe you prefer that people use your title when addressing you. Maybe you like to see your name in lights. Maybe you drive a fancy car. Everyone has a desire to express and elevate their status, and the right item to do that will make someone say, I gotta have this, price be damned. Chapter 6 of My Life in Advertising, Personal Salesmanship. While Claude C Hopkins worked at Swift and Company selling the lard substitute Cotosuet to home users, the company was having a hard time selling to bakers. The price was higher than the competition. Hopkins insisted that price has nothing to do with salesmanship, and he sets out to prove it. People want status, prestige, and recognition. Printing the bakery name on an advertisement was reason enough to buy the placards for the window, and with it, the Cotosuet used in the baked goods. In highschool we had to vote for a student government representative for our homeroom, the room we started and ended each school day. There were two candidates in our homeroom. One candidate was studious and seriously wanted the job — she had plans! The second candidate was a goof who spent most of his school day talking with people. He was charismatic, but he didn’t have any plans for the school government if he was elected (but let’s be honest, those organizations don’t accomplish much anyways). Everyone is drawn to a charismatic personality. Many of us believe charismatic people are born this way, and their leadership skills are an effortless result of their charisma. This is the story we tell ourselves. This story keeps us from looking at our own skillset to see where we fall short. But this story is not true. You, too, can develop charisma and become an effective leader. Check out this totally fantastic photo from 1989. My family was just moving into our new home. I had just turned 10 years old. The shorts say it all. 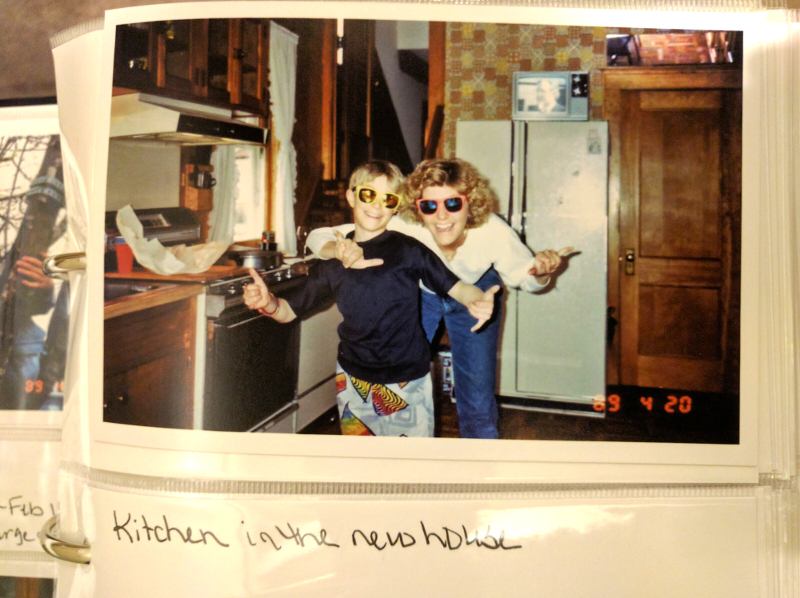 I was looking for a photo of the kitchen carpet in this kitchen from when my grandpa owned the house. I couldn’t have hoped to find a gem like that photo above. Chapter Three of Claude C Hopkins’ book, My Life in Advertising. This is the current #PRL selection of books that discuss and teach influence and persuasion. Join #PRL to receive exclusive updates and content to improve your own persuasive powers and understanding of influence! Hopkins opens Chapter Three with a story. The summer after highschool graduation, Claude C. Hopkins took a job as a school teacher on the weekdays and a preacher on the weekends. One weekend his mother’s strict congregation asked him to speak. Claude had developed new ideas about religion, different from his strict upbringing. He knew this opportunity would test his relationship with his mother. Claude spoke at the church anyway. His mom was, let’s say, not happy. She took him to a restaurant and broke up with him. Hopkins couldn’t afford to eat regularly, and craved hot pie for dinner. Welcome to Persuasion Reading List. This is the next part in a series of Executive Summary posts of the book My Life in Advertising. Find previous posts on this book here, and thanks for your visit.